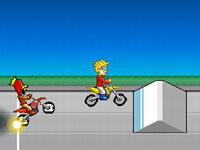 Description: Race your bike, truck, quad or skateboard over hills and obstacles and finish each level without falling. . Uphill Rush is a Bike Games. Instructions: Up arrow- To accelerate. M key- Show/hide mini map. Z- Use turbo (doubles the player's speed for 5 seconds)..